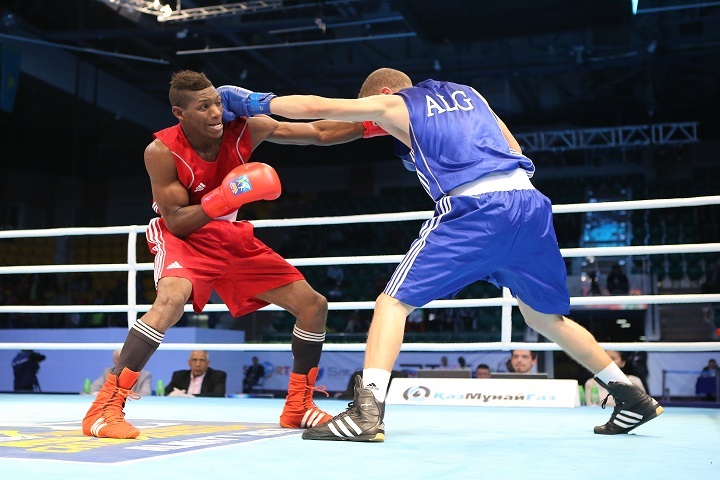 Cuban superstar Arisnoidys Despaigne narrowly scrapped past outstanding Algerian Boxer Llyas Abbadi at the AIBA World Boxing Championships Almaty 2013. This wasn't the only intrigue of the day; with the Lightweights (60kg) Welterweights (69kg) and Light Heavyweights (81kg) all in action today, we had our fair share of talking points. Let's take a look at some of them. Cuba icon Arisnoidys Despaigne faced tough Algerian Llyas Abbadi at Welterweight this evening. Abbadi, who was impressive in his opening bout against Daniel Tapia from Chile, caught our attention again today. The Algerian boxer really made life tough for the Cuban. He boxed extremely aggressively and at a ferocious intensity. The force and effort being put into the bout got the neutral crowd cheering for both athletes in appreciation and the high pace continued through to round two. It was so fast and furious in fact that the pair made their (very competitive) counterparts in the other ring look like they were merely engaged in a light sparring session. Whilst the Cuban looked like he was landing more blows, it was clearly the Algerian who was trying to force the issue. By the end of round two however, the situation had somewhat reversed with the Algerian burning out slightly and trying to get on his bike with the Cuban in hot pursuit. By the time round three came about, the Cuban's accuracy rather than Abbadi's commendable courage was having more of an impact. If Abbadi's plan was to make the Cuban scrap hard, then in this at least, he succeeded. Sadly for him it was not enough to steal the win and Despaigne took the bout 3:0. The effort did at least earn them the bout of the session and respect of the crowd though. Nikita Ivanov of Russia went toe to toe with Avni Yildirim from Turkey. Both boxers were working from tight guards and then trading blows. The Russian seemed to be much better at that particular game, successfully bobbing and weaving out of trouble when absolutely necessary, but more often than not just relying on his offense to keep his opponent under siege. With both boxers favouring hooks and uppercuts, this was never going to be a bout that was fought at distance, nor a spectacular crowd pleaser. So like two bulls locking horns, the pair pushed and shoved for position in ugly but effective boxing before unleashing lightning fast shots at point blank range. The APB boxer took the bout comfortably enough in the end, 3:0. Robert Harutyunyan of the German Eagles was in action this evening against another WSB boxer Mohamed Ouadahi from the Algeria Desert Hawks. In a tough match-up for both athletes, this one was another contender for the bout of the session. The German was his usual tenacious self and really pressurised his opponent once he gets in close. The Algerian however is a highly capable boxer and can strike from any angle, including while on the retreat or moving laterally. Consequently, this became a very interesting stylistic match up, with Harutyunyan trying to close without being caught by Ouadahi's unexpected shots. In the end it was the German Eagles boxer who won this tactical battle and the bout itself, 3:0. Ali Ghoussoun, the Road to Almaty boxer from Syria took WSB veteran Hrvoje Sep of Croatia out of the competition by the slightest of margins at Light Heavyweight. The WSB star was looking to close the gap and box on the inside, whilst the Syrian was trying to keep him at bay. The bout was very close, a fact which in itself stunned the arena. The Croatian couldn't seem to get into his grove and from time to time he looked a little out of sorts. The bout became quite ugly, with Sep unable to find form. This only played into the Syrian's hands. Desperate to keep the bout at close quarters, Sep was warned for holding. This proved to be a pivotal point in the match. When it came to the decision, the judges awarded the bout to Ghoussoun 2:1 and thus the biggest surprise win of the day went to our (by default) Road to Almaty boxer of the session. Lightweight Luis Diaz of Venezuela is proving to be quite a boxer. Picked up by the media section and awarded bout of the session the last time he graced the canvas in these Championships, he made a similarly good impression on this occasion. He has beautiful form and excellent timing. During his bout with Elian Dimitrov of Bulgaria, he took the centre of the ring and seemed almost untouchable with the snake like movement of his head being too hard to predict. He stands with a low lead hand for much of the time, inviting the opponent in and then finding the openings presented to him. He took another nice win today. "I thank god for the victory", said the Venezuelan. "I just have to take this one step at a time but it's another win on the board". When asked to describe his style he said: "what I like to do is to box on the outside. It gives me more chance to watch the opponent, and it is more technical as well".